My Own View of Toei Ltd. Getting Inspired By American-Made Movies and TV Shows! When I think about Toei Ltd., I always thought that the company itself not only produces its own shows but has inspiration from western shows. Here's my attempt to write this rather ambitious editorial which I hope may soon ignite some discussion. In the past, Toei had a relationship with Marvel where it got the intellectual property rights with Spiderman. I admit Stan Lee was impressed but I thought it was partly lazy, considering that they could have decided to make a Spiderman-based hero than a Japanese Spiderman. 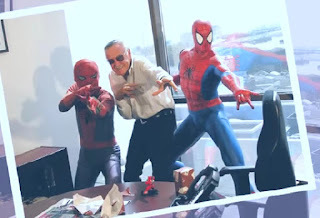 But still, I'm impressed that Stan Lee was impressed by Toei's Spiderman. Battle Fever J as a Super Sentai series also had Marvel influence in how the suits were designed. However, Marvel and Toei didn't have any much projects together after that. The success of Robocop in July 17, 1987 would soon inspire two Robocop-based Metal Hero series namely Jiban and Janperson, and one extra hero for Carranger known as Signalman. Apparently, Toei may have a soft spot for Robocop. While Jiban's main character Naoto Tamura was a slain police officer restored from the dead to fight the Bioron Syndicate, Janperson was a crime-fighting robot who tackles on criminal cases the same way Robocop handles them. Signalman in Carranger was an obvious parody and homage to Robocop; complete with a wife named Sigue and son named Sigtaro, who both look like him. 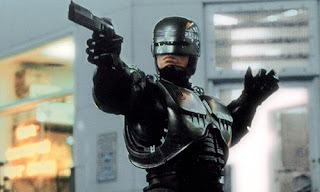 Compared to the Japanese Spiderman, I praise Toei for actually getting inspired to create a Robocop-inspired hero than make a Japanese version of Robocop. 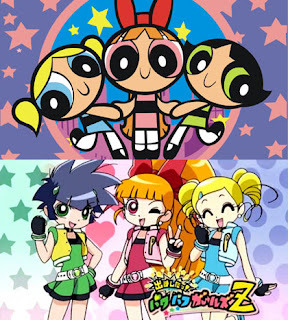 If Toei Ltd.'s studios could go ahead and modify Robocop's concept into Jiban and Janperson, Powerpuff Girls Z was definitely one Anime that had caught me off-guard. 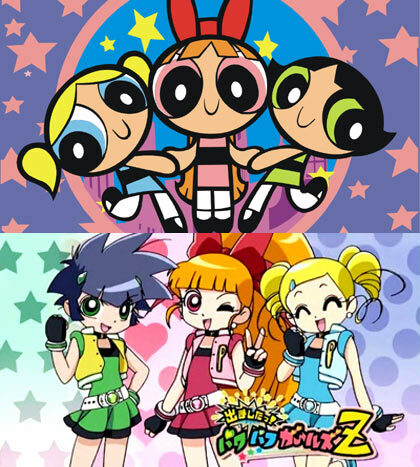 Unlike the original series where the Powerpuff Girls were laboratory accidents and were considered "sisters", the Powerpuff Girls Z are teenagers with attitude who get endowed with Chemical X. It's just like how Robocop was formerly human but Janperson is a purely mechanical version of Robocop. The Anime also added several new characters like Professor Utonium is a single father to a son named Ken, the talking dog is a robot dog named Poochie and the series even had a grand finale where the Powerpuff Girls defeated Him in an epic clash. While watching the Heisei era of Kamen Rider, I cannot deny how I end up getting either all nostalgic with my childhood or want to compare a certain season to a certain American-made show. My first instance of doing a forced comparison between Kamen Rider Kiva and Danny Phantom, or some fans might actually do a Kamen Rider Kiva and Twilight comparison. During Kamen Rider Wizard, one might think that it's a Harry Potter inspired Kamen Rider or in my own joke, Fairly Oddparents inspired. I even compared Kamen Rider Fourze to the otherwise short-lived Jimmy Neutron spin-off, Planet Sheen. Quite interestingly, it was said by Kamen Rider Wiki(can somebody give a better source, thanks) that the producers of Kamen Rider Drive called it a "Kamen Rider meets Knight Rider type of show." and although I am not all that fond of Knight Rider, the idea is apparently taken from that show. What might be observed is how some seasons of Kamen Rider have that American influence. Kamen Rider Amazon is an obvious shout-out to Tarzan and Jungle Book. Kamen Rider Super-1, well I can't really name the American influence that might have inspired that show but I feel it does exist. Kamen Rider Agito and Kamen Rider Faiz felt like it had inspiration from Marvel Comics with how the Lords play in the part of human evolution like the Celestials in Marvel Comics or how the human/Orphnoch war is akin to X-Men's mutant vs. human war. What was interesting is that Power Rangers Time Force tried to address the issue of racism with the mutant vs. human war, something that was also done with Jiban. Kamen Rider Fourze also felt like a combination of Grease (and the main Gentaro Kisaragi feels like a parody of Danny Zuko) while revisiting the concept of Saban's Masked Rider of having a teenager for a Kamen Rider in contrast to the usual cliche where the hero was somebody past eighteen. Even when I look at Saban's Masked Rider as a huge failure, it's weird how some it might have contributed to Tokusatsu. For instance, I did mention that Kamen Rider Fourze is the first Kamen Rider to take place in high school. The other would be how Saban's Masked Rider had a crossover with Mighty Morphin' Power Rangers and years later, we would getKamen Rider Decade would have a crossover with Shinkengerwhich would be followed up by Super Hero Taisen, Super Hero Taisen Z, Ressha Sentai ToQGer vs. Kamen Rider Gaim and Shuriken Sentai Ninninger vs. Kamen Rider Drive. I also feel the same way about Super Sentai which I feel like Starninger is a mythology gagto the idea of Western influence in the midst of Japanese influence. The idea may have already been there for more than one instance. I would like to think of instances where I felt where Super Sentai got inspired by American made TV shows and movies. While I didn't really notice it before but you might see some American influences here and there. Megaranger's selection process may have been inspired from The Last Starfighter where the winner of the game gets chosen to become a hero. Timeranger may be inspired by the 70s series Future Cop and Men in Black (because they were recapturing alien criminals rather than killing them on the spot). 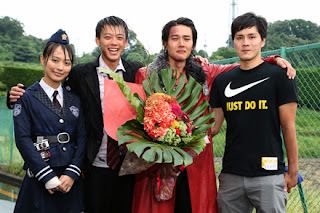 Dekaranger may be inspired by the several seasons long C.S.I. TV series and Men in Black while some of its episodes were inspired by Speed, Die Hard, Rocky and Armageddon. 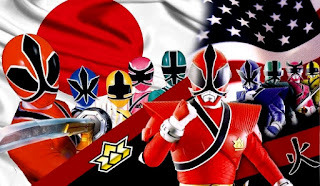 Magiranger may have been inspired by Lord of the Rings and Harry Potter, which while they were based on British books, they were American productions. Boukenger may have been inspired by Indiana Jones where the heroes sought to keep treasures away from certain agencies of evil. Go-onger may have also taken the idea of talking cars from the Disney movie, Cars (which during that tme, Disney not Saban handled Power Rangers). At the same time, one can look at how post-Timeranger Super Sentai seasons may have also ended up getting influenced by Power Rangers. If you remember the Battlizer in Magiranger vs. Dekaranger, it was taken all the way from Power Rangers S.P.D. and not the other way around. What's more important to notice is that while Power Rangers tried to be more serious than usual during Judd Lynn's era in the 90s, Super Sentai would later tone down after Timeranger. Super Sentai started having less intense action scenes, less drama and more kiddie. 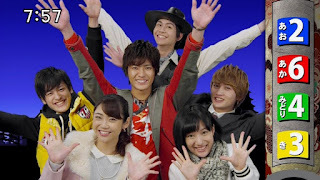 Go-Busters felt like it was inspired in part by Power Rangers RPM with stuff like the Messiah virus (similar to the Venjix Virus), Escape as a fully non-human version of Tenaya and Jin Masato who I view as the show's version of Dillon. What I also find funny is how Abarangers appeared on the tenth anniversary of Mighty Morphin' Power Rangers (while Power Rangers was under Disney) and Kyoryuger appeared on the twentieth anniversaryof the said show. (during the Neo-Saban era) Abaranger showed up two years after Jurassic Park III was shown in 2001. I always found it weird or two, did Toei really plan all these things out or is it just a coincidence? I don't think so, I feel like everything has been timed well one way or another. When you look at the world, there will always be cultural exchange and there's no pure culture these days. For instance, Filipinos are Filipinizing food items that were introduced by the Spanish, Chinese and Japanese either by conquest for by cultural exchange. After World War 2, both Japan and America have become allies so an exchange of culture became inevitable. It would be important to do a cross cultural study because as said, culture must change whenever needed. Likewise, Toei's success can also be attributed to their wide understand of cultural adaptation. If it wasn't for cultural adaptation, I doubt it we'd be enjoying that they have to offer. With Disney already obtained Marvel, I've got a big doubt of how Rider and Sentai would look like should Marvel and Toei start working together again. You don't want a history to repeat itself again when Disney nearly ended Power Rangers franchise after RPM before Saban regain their rights back, in addition with the proposed Power Rider that seems there is no development so far. Will Sanders: Is already happen and it ic call Marvel: Disk War Avengers and it is awesome despti the silly premise. If Marvel and Toei worked together again, wouldn't that mean they had ties with Disney again? Either way, it's still an awesome idea!! Shows always influence each other. Last generation show will influence the current gen creator. It's impossible to create something good without any influence. But influenced is different from copy. Creating a new show is a mix 1 or 2 old things + something new, anything that's recently become trends. Like W take the first two double rider and skull man combine with flash memory and search keywords. Or like in OOO's Birth is Iron Man + Japanese armor and change Stark's money to vending cell medal gachapon. Even in western, Everyone knows that Pacific Rim is a tribute to Kaiju Tokusatsu. Considering the timing I wouldn't be surprised if part of the reason Disney sold PR rights to Saban was cause they wanted marvel to be the major property of action series. I'll be curious to see how long PR sticks with nick as they don't promote it nearly as heavily as nick original series. I think we'd see more marketing & promotion if nick bought rights outright. This article is more about assuming that certain archetypes and themes came from American ideas. Such as the cross over between super sentai and Kamen rider, which has been standing since Ichigo, Nigou and the first two sentai created by Ishinomori Shotaro . Also using his nostalgia for American cartoons doesn't add any value to his argument. This is more speculation than anything.